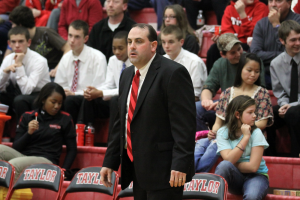 For the first time in 20 years, a coach other than Jeff Fisher earned a victory on the Taylor boys basketball sideline. After a tough 67-58 opening night loss on the road to a very good Lapel (3-0) squad, the Titans bounced back to knock off Tri-Central 70-54 for Andy Lewman’s first win as the Taylor head coach. The following night, Lewman and his Titans snared a statement win as they knocked off Class 2A No. 17 Oak Hill 55-50. As with any new coach, Lewman acknowledges that it will take time for his squad to understand his system and coaching philosophy. Lewman found a star emerging as senior Dale Ray Washington led the Titans against Tri-Central with a double-double of 19 points and 14 rebounds. He followed that with a team-leading 11 points in the upset victory over Oak Hill. But despite the good start, Lewman does not want his Titans to coast through the season. Taylor (2-1) is back on the floor Friday night when they host Northwestern (2-1) at 7:30 p.m. This entry was posted in Basketball, Taylor. Bookmark the permalink.